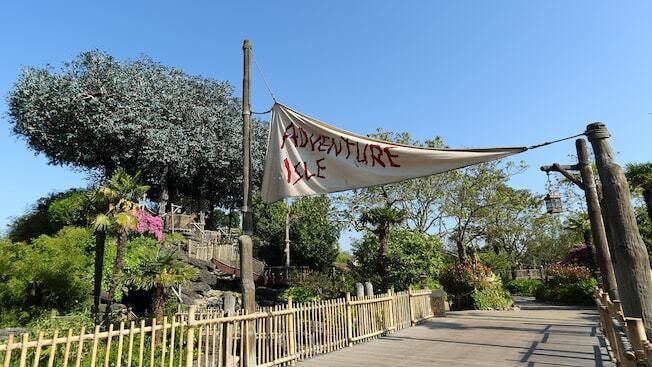 Adventure Isle One for the budding treasure hunter—a trek they’ll never forget. From the eerie gloom of Skull Rock to the stunning landscape of Spyglass Hill, there are secrets and stories to uncover at every turn. Keep a watchful eye on what’s ahead, as danger lurks beneath crisscrossing suspension bridges, beside narrow pathways and within spooky caves. 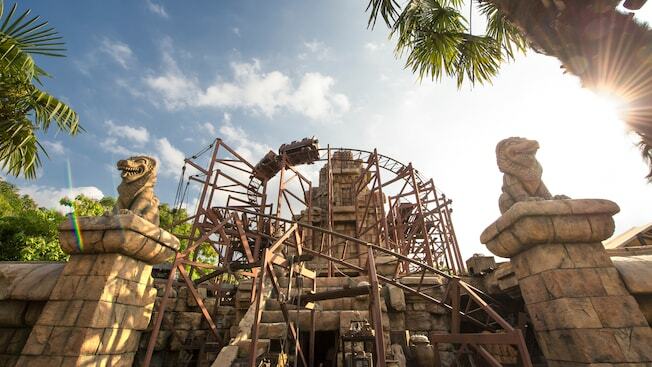 Following the map of the Adventure Isle and deciphering the mind-boggling smugglers’ runs rewards you with spectacular daytime views of the whole land. And after nightfall, hanging lanterns supply an altogether different feel. Alice’s Curious Labyrinth Embark on a fantastical voyage into the White Rabbit’s Hole and out the other side via Tulgey Wood and doors of various sizes in Alice’s Curious Labyrinth. Encounter famous magical creatures, decipher conflicting signage, meet the Cheshire Cat and take on the Queen of Hearts’ daunting maze, where card soldiers pop up to a scream of ‘Off with their heads’. 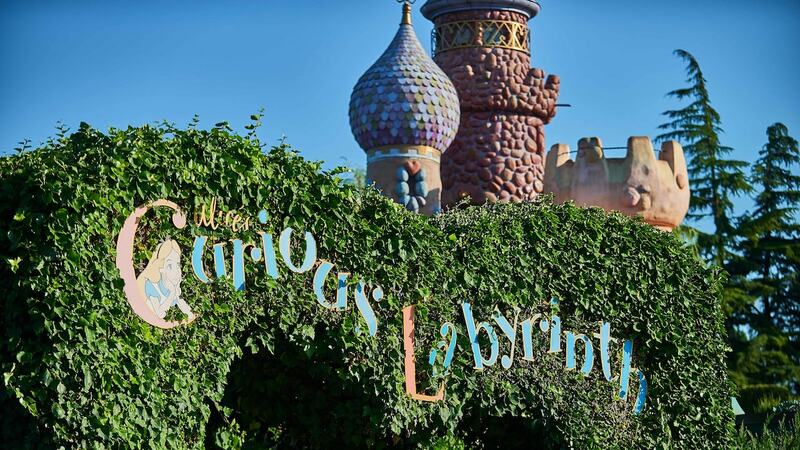 And once you’ve made it to Sleeping Beauty Castle intact, enjoy your reward—a beautiful view of Fantasyland and Alice’s Curious Labyrinth. 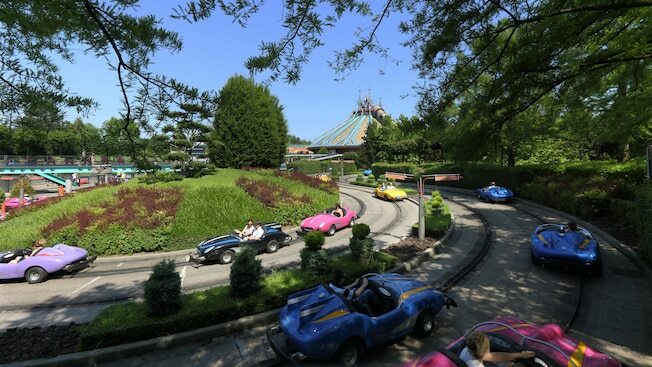 Autopia Take the wheel of a futuristic car, as envisaged by inventors in the 1950s, and accelerate your way along a winding, picturesque route. Make sure you strap yourself in, as you zoom around or take it easy with a casual countryside cruise in this celebration of automobile utopia. Big Thunder Mountain Climb steep heights and dive below raging waterfalls in this family-friendly, rattling race in a speeding mine cart. 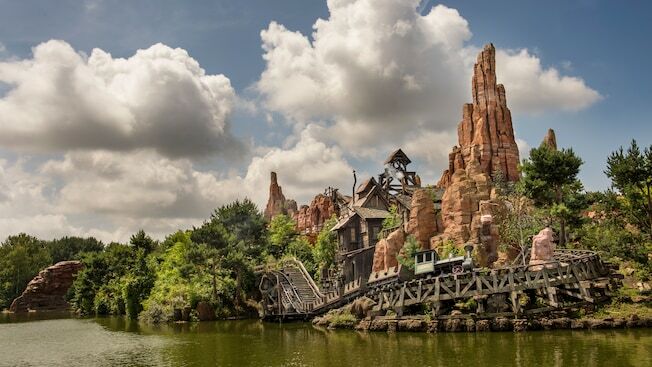 Board a mysterious train deep in the heart of a legendary mountain for a thrilling journey of dips and sharp turns beneath Rivers of the Far West and around a ghostly mining town. As you plummet through the darkness along a dynamite-littered track, a huge explosion shakes the cavern. But the train doesn’t slow up, hurtling you onwards amid the rumbling sounds of a falling mineshaft. Bats swoop. The tracks shake. A river rages above…… Snow White and the Seven Dwarves Heigh Ho! Heigh Ho! With Blanche-Neige et les Sept Nains, experience the story of Snow White like never before, as you and your little ones roll through an enchanted land. 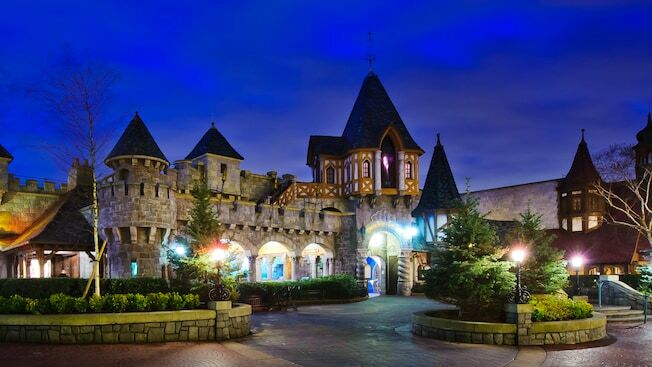 Get closer than ever to the famous fairytale by looking into the evil queen’s mirror, travelling carefully through the haunted forest and dropping in on the seven dwarfs at their cottage. 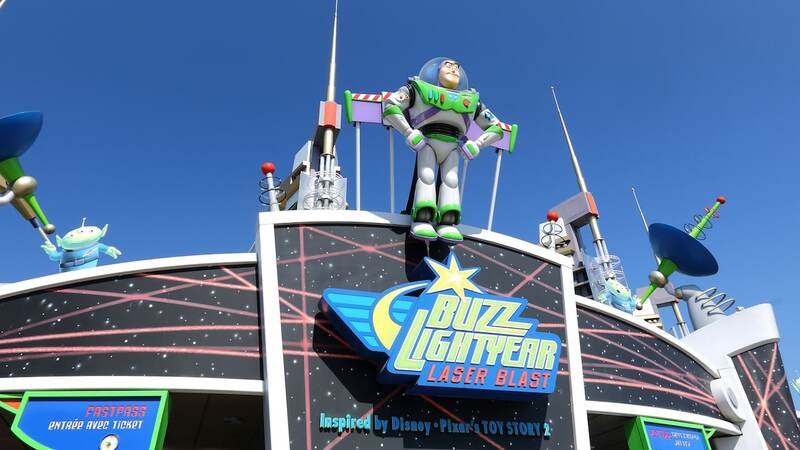 Buzz Lightyear Laser Blast This is an exciting ride into space that continues the epic battle between Buzz Lightyear and Evil Emperor Zurg, as seen in the popular Disney Pixar Toy Story film series. Evil Emperor Zurg is stealing batteries from helpless toys to power a new weapon of destruction—and Buzz Lightyear needs your help! As a Junior Space Ranger, it’s up to you to manoeuvre an XP-40 space cruiser through the shadowy Gamma Quadrant and fire lasers from an onboard cannon to stop Zurg and score points. Casey Jr— Le Petit Train du Cirque All aboard for a ‘mini’ tour of the fairytale homes and villages made famous in classic Disney animated movies. 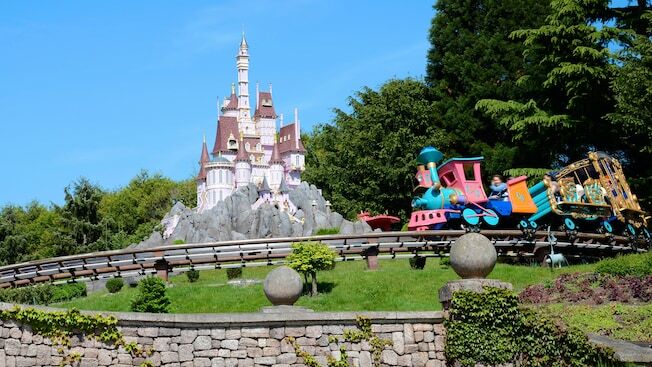 Hop inside a festive animal cage or ornate sleigh and follow brave engine Casey Jr.— le Petit Train du Cirque from the classic Disney animated movie Dumbo—on a journey through Storybook Land. As you gracefully make your way over hills and through valleys, behold a brilliant tapestry of familiar settings from classic Disney movies, amazingly rendered in miniature scale. Discovery Arcade Stroll along this warm, gas-lit homage to the imaginative and bizarre ideas and inventions for the future. From ingenious patents to dreams of a utopian world, it’s all here, with startling posters and display cases filled with visionary gadgets. It’s a truly inspiring depiction of human hope and innovation. 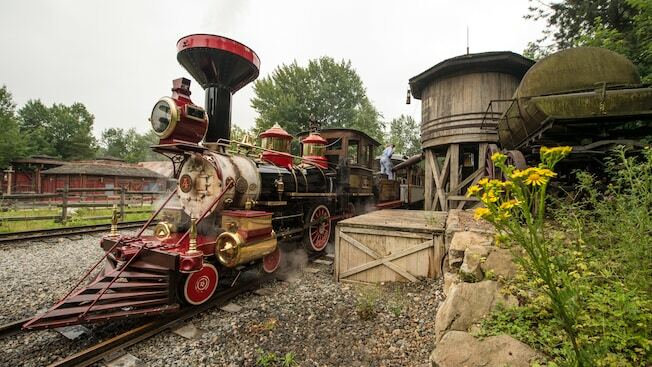 Disneyland Railroad This 20-minute Grand Circle Tour on board an authentic steam-powered train chugs along offering convenient stops at Main Street USA, Frontierland, Fantasyland and Discoveryland. 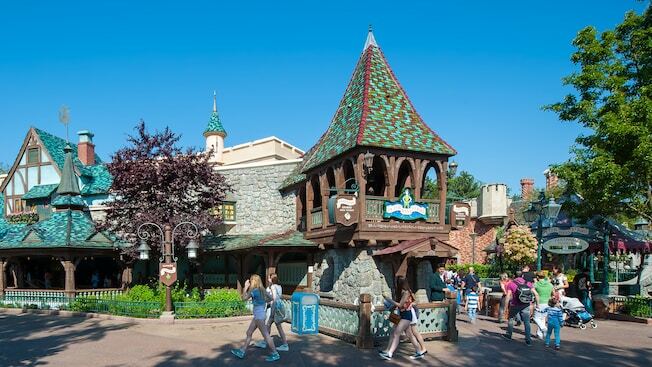 It’s the perfect way to preview the magic of Disneyland Park and take in the picturesque scenery. It’s also a handy way to get around quickly and easily. And because the trains are scheduled to arrive regularly throughout the day, you’ll have just enough time to take in all the sights at your station. Dumbo The Flying Elephant Hop atop Dumbo and take off into the air on a joyful journey to the jubilant sounds of carnival music. Accompany everybody’s favourite circus elephant as he discovers his unique ability to fly. Dumbo’s faithful friend, Timothy Q. Mouse, greets you from the arched entry, directing the action with help from his ‘magic’ feather. 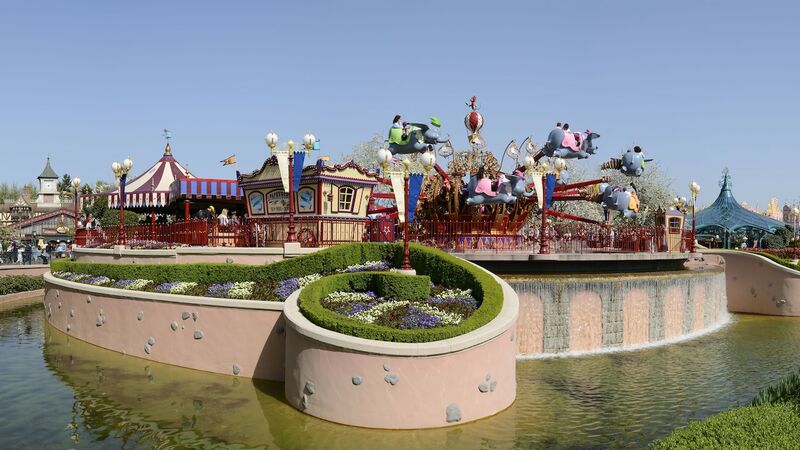 As a jovial fairground organ melody begins, Dumbo the Flying Elephant gracefully lifts off from the ground and magically begins to fly around and around. Horse-Drawn Streetcars If you want to avoid the hustle and bustle of the sidewalks between Town Square and Central Plaza, then why not travel in style? 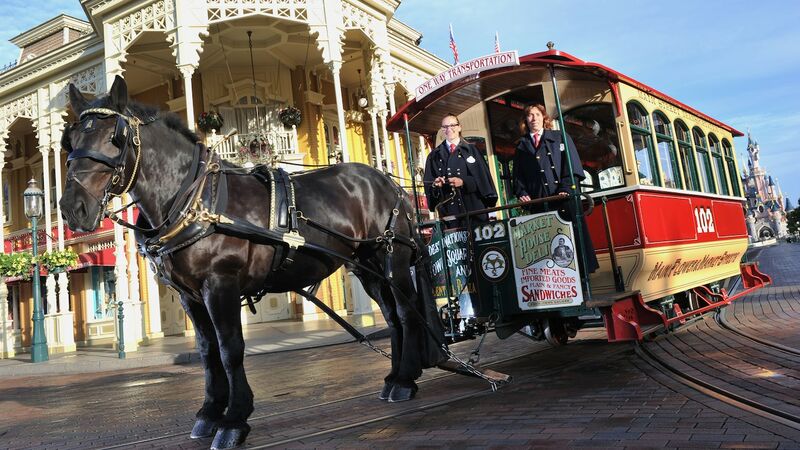 Just climb aboard one of Main Street’s ornate horse-drawn streetcars and let your majestic Percheron clip clop along the brick-paved streets while you relax in ultimate splendour and comfort. Indiana Jones and the Temple of Peril Sent to investigate what happened to an earlier expedition, you soon discover something is far from normal in the Temple of Peril. The base camp is deserted of people yet full of their clothes, food and equipment. Above the swaying canopies stands a temple ruin, below your feet is a well-trodden path. As you meander your way through dense undergrowth, stone snake sculptures jump out and stare menacingly at you. A faint rumble and screaming can be heard in the distance……. 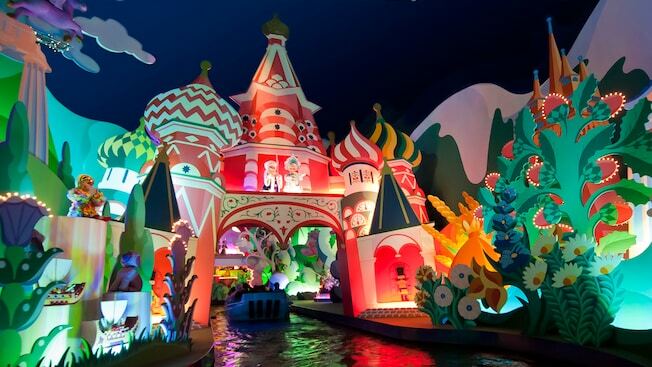 It’s A Small World Sing along to the classic anthem of world peace during a delightful musical boat tour hosted by the children of the world. From a colourful dock, climb aboard a cosy boat and set sail along the Seven Seaways Waterway on a 10-minute journey. Amid a vibrant, multi-coloured backdrop exquisitely crafted out of papier-mâché, glitter and fabric, behold a cast of almost 300 traditionally dressed dolls from nearly every corner of the globe sing a simple song in their native language about universal harmony and dance. 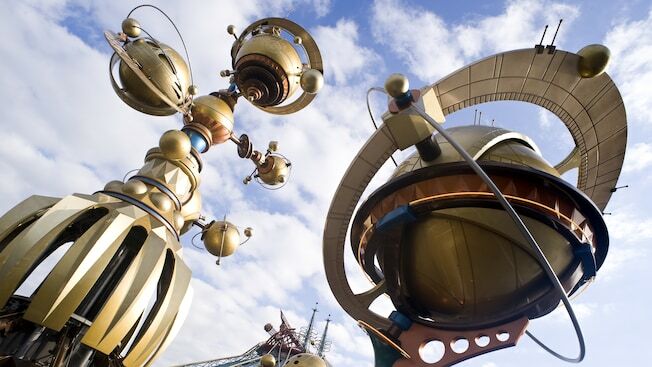 Travel to all 7 continents and, by journey’s end, see for yourself that it truly is a small world after all. 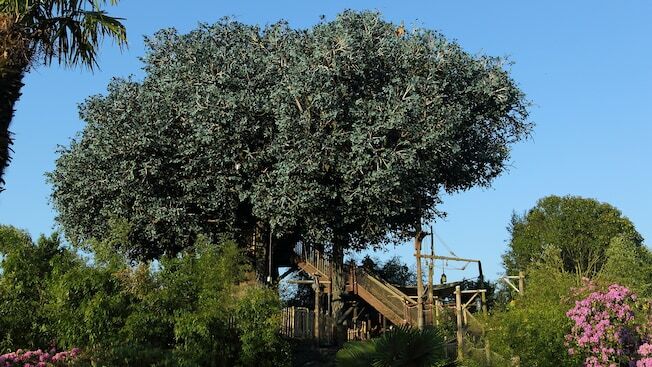 Swiss Family Robinson’s Treehouse Climb high in this magnificent tree house that the Swiss Family Robinson call home. Here, you can ascend an intricate series of walkways and stairs that lead to a layout of beautifully detailed rooms, including a kitchen, library and some bedrooms – all filled with salvaged decoration. And when you reach the lookout area at the top, grab a telescope and enjoy the stunning views of the island below. 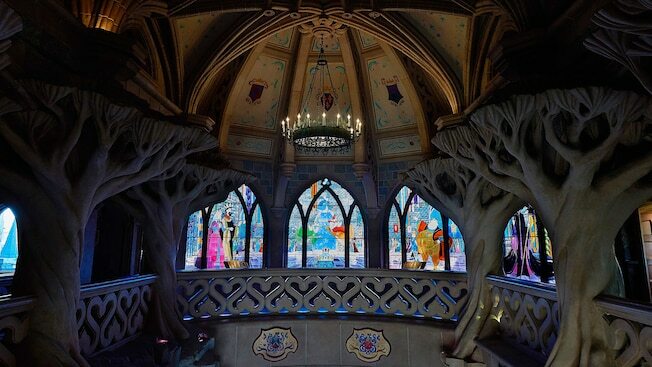 Sleeping Beauty’s Gallery Scale the stone steps inside the Sleeping Beauty Castle and enjoy a retelling of this famous fairytale through lavishly illustrated books, rich tapestries and truly majestic stained glass windows. 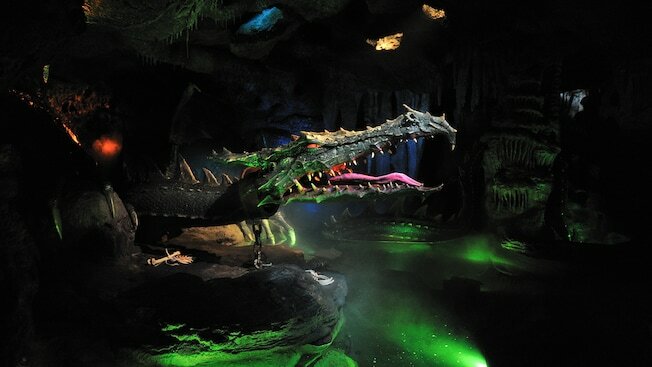 The Dragon’s Den Tip-toe through the dark dungeon ‘La Tanière du Dragon’ underneath Sleeping Beauty Castle, where a monstrous prisoner lurks. Once the ruler of the skies, this defeated dragon lies chained against jagged rocks. It may be dozing, but tread carefully, as one false move will lead to a hot, rumbling surprise. 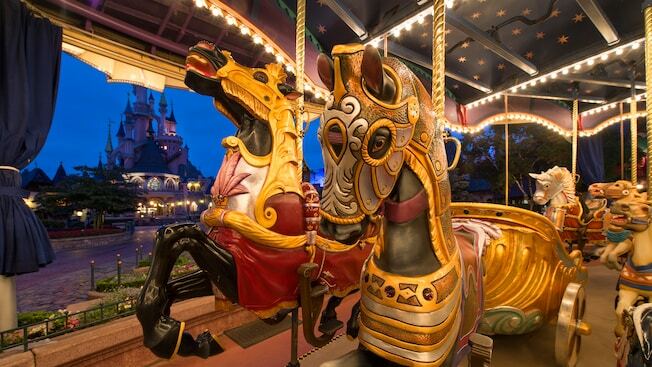 Sir Lancelot’s Merry-go-round Young knights suit up and mount a hand-sculpted, noble steed on Disney’s merry-go-round, before setting off on a whimsical fairytale ride they’ll never forget. Aladdin’s Magical Passageway Set foot inside the winding stone passageways of Agrabah and make your own wishes come true. 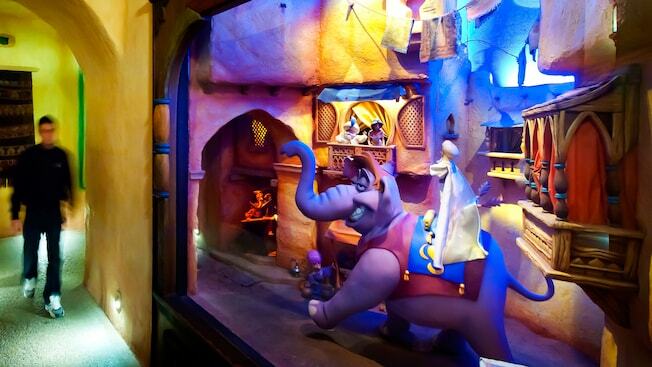 Travel through ‘le Passage Enchanté d’Aladdin’ at your own pace, as you wander past magical sets recreating famous scenes from the film. The Country of Fairytales Hop inside a colourful 15-person boat for a gentle cruise through the enchanting realm of Disney’s Storybook Land. 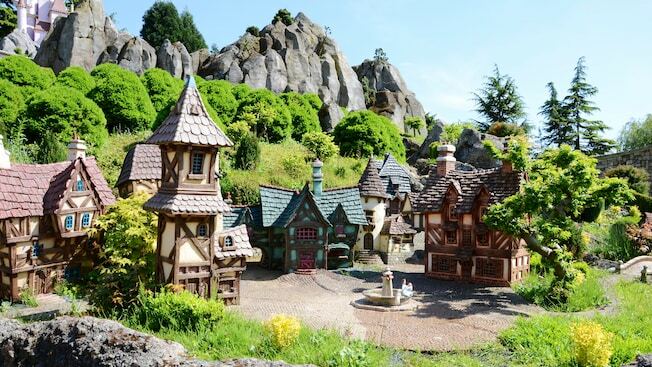 As you gracefully make your way past hills and through valleys, discover a dazzling assortment of charming homes and villages from classic Disney movies, beautifully rendered in miniature scale. Along your quest, keep an eye out for intricately replicated settings, complete with imaginative landscaping, charming music and special lighting effects. The Mysteries of Nautilus Dive into the imagination of Jules Verne and board Captain Nemo’s historic submarine. 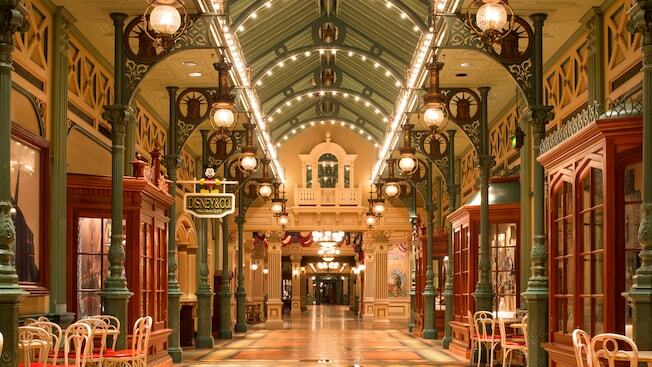 As you wander the corridors you’ll discover some seafaring secrets. But don’t let the calm waters of 20,000 Leagues Under the Sea fool you, as danger lurks beneath the murky surface. Pinocchio’s Travels Board a wooden car, enter Stromboli’s Marionette show and witness Pinocchio dance and sing with a duo of puppets. Stromboli then locks Pinocchio in a cage and your adventure across distant lands unfolds. Keep your eyes peeled for familiar foes, such as the Coachman,. 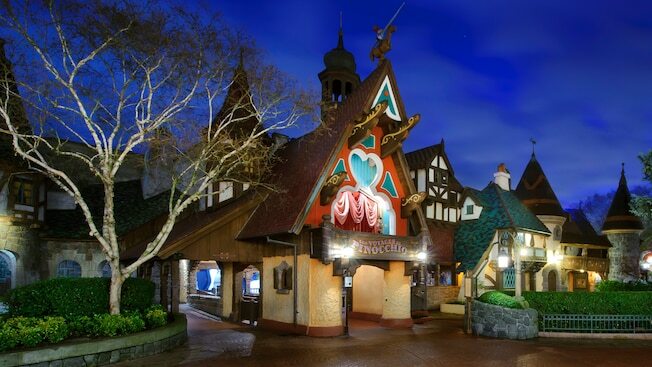 Watch as Pinocchio transforms into a real boy and Geppetto’s Workshop comes alive. 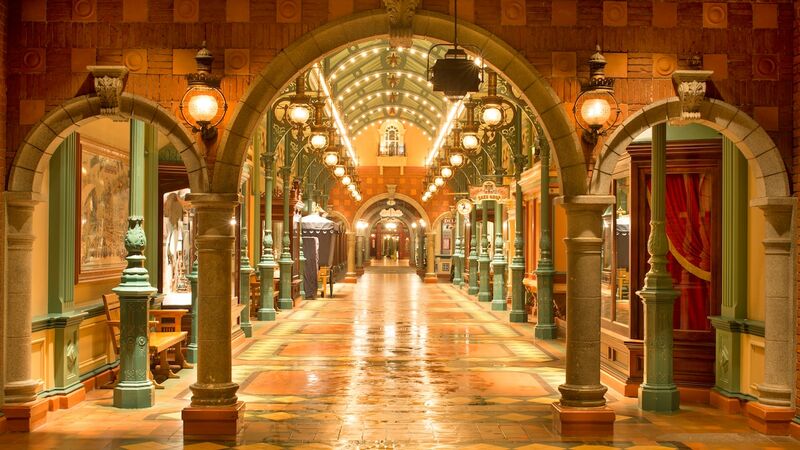 Liberty Arcade Discover the story of the Statue of Liberty, as you stroll along this beautiful, Liberty Arcade at Disneyland Paris lit by gas lanterns and built from ornate ironwork. Historic photographs, artwork and display cases illustrate the inception and construction of Lady Liberty in a tale that links France to the United States of America—you can even take part in the statue’s inauguration at Statue of Liberty Tableau. 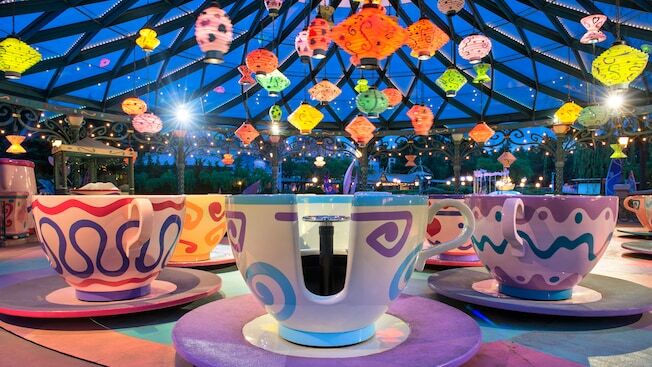 Mad Hatter’s Tea Cups Every day is a very merry unbirthday for the Mad Hatter. And he’s invited you to pour yourself into one of his oversized teacups for a whimsical whirl accompanied by festive music. 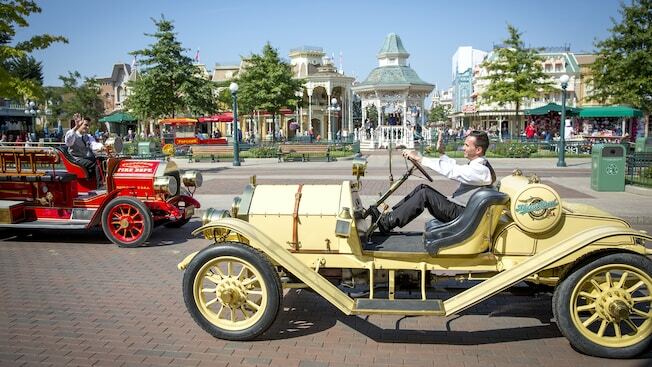 Main Street Vehicles Catch a nostalgic ride to and from Town Square aboard a vintage vehicle. Board a classic Mercer, Paddy Wagon, Omnibus, Fire Engine or Limousine and sit back as you are ushered from one end of Main Street USA to the other. Along the way, behold a bevy of 2 and 3-storey-high, Victorian-themed shops and restaurants from a time and place long since passed. Meet Mickey Mouse This is no illusion. 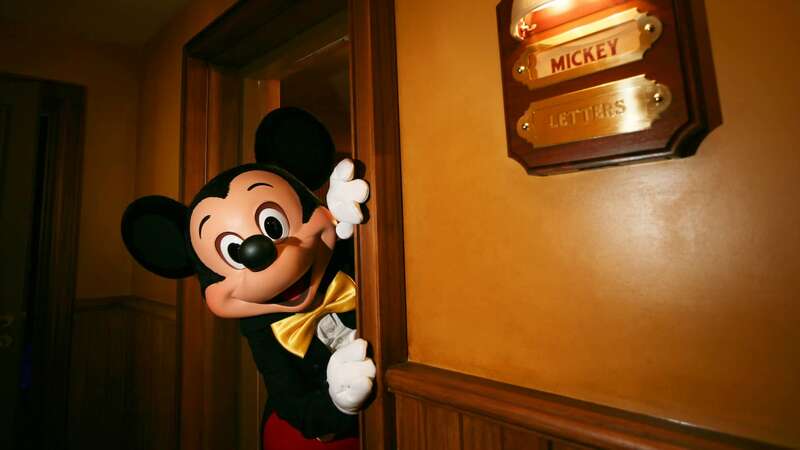 Magician Mickey Mouse has invited you to his dressing room for a chat and a look at his favourite magic tricks, costumes and props. You’ll discover the crow’s feather that helped make Dumbo fly, Mickey’s hat from Fantasia and a collection of tools used in the most daring of escapades. Mickey may even perform a card trick or two before posing for that all important photo. Orbitron Get ready to rocket through the farthest reaches of space in this retro Orbitron ride inspired by Leonardo da Vinci’s visionary drawings of the solar system. 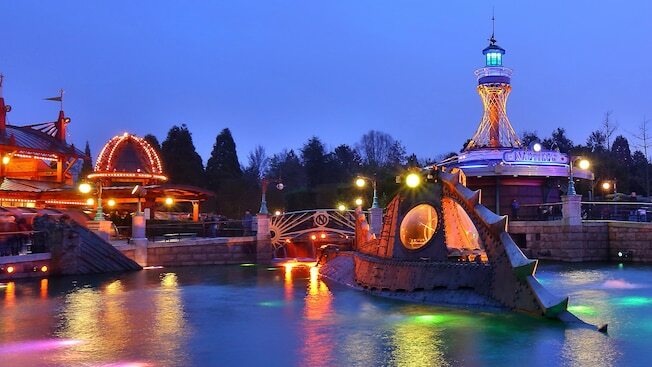 It’s fast, it’s futuristic and you’re the captain, as you control the height of your vessel whilst it whizzes around a galaxy of planets high above the sights and sounds of Discoveryland. Pirate’s Galleon Gather ye little rapscallions, man the decks and commandeer the Disney Pirate Galleon. Young marauders can scarper from port to starboard and inspect the cannons. But they mustn’t let their guard slip for a second, as pesky pirates will have them walking the plank in no time at all! 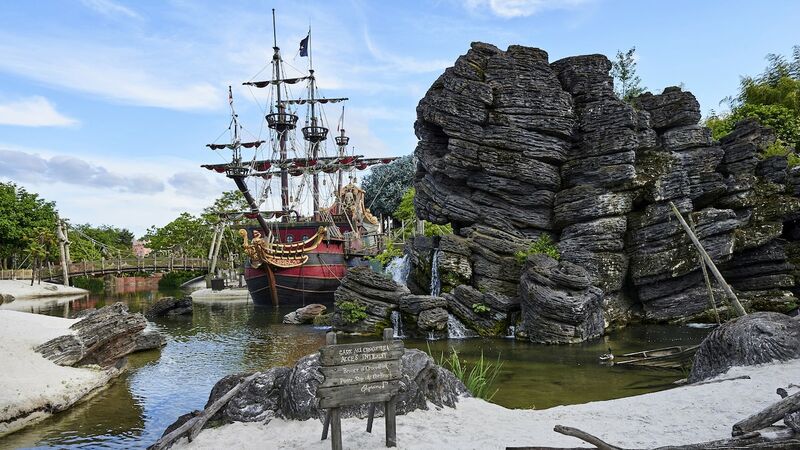 Pirates Beach Maraud deep into Adventureland through dark caverns and past Davy Jones’ Locker to Skull Rock. 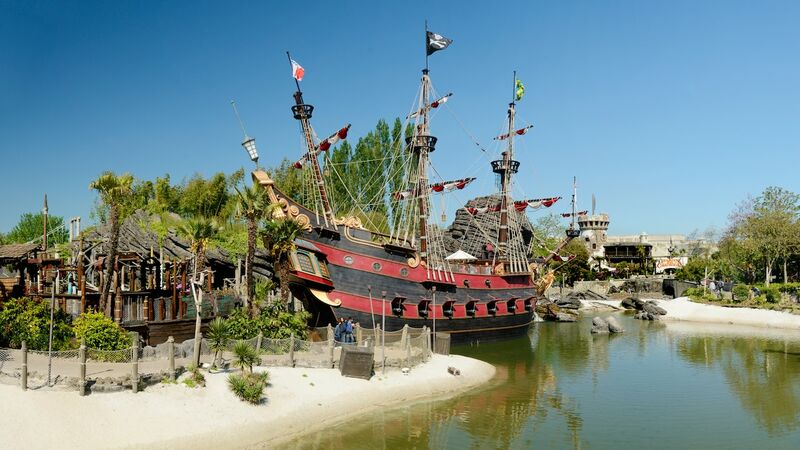 Once at Disney Pirates’ Beach, you’ll unearth two pirate playgrounds loaded with rope ladders, slides and even a plank that’s sure to keep little rapscallions in check. Pirates of the Caribbean Man the decks and hoist the rigging. Round up thos rapscallions, escape to a moonlit lagoon, board your vessel and set sail on a refreshed voyage through a fabled age. Musket fire and explosions fill the air as you join Captain Jack Sparrow on his quest to unearth a hidden treasure. Behold boisterous buccaneers merry on Nelson’s Folly and the spoils of plunderin’ during a frantic cruise through the Old World. 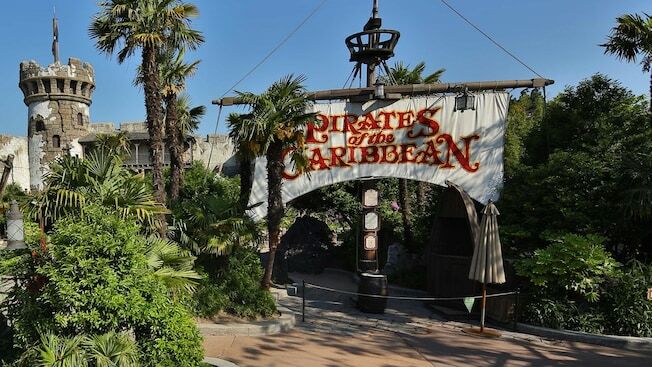 And sing along as windswept pirates serenade you with the legendary songs. Pocahontas Indian Village Head for the shadow of Thunder Mesa at Pocahontas Indian Village and set your sights on what lies just around the river bend. 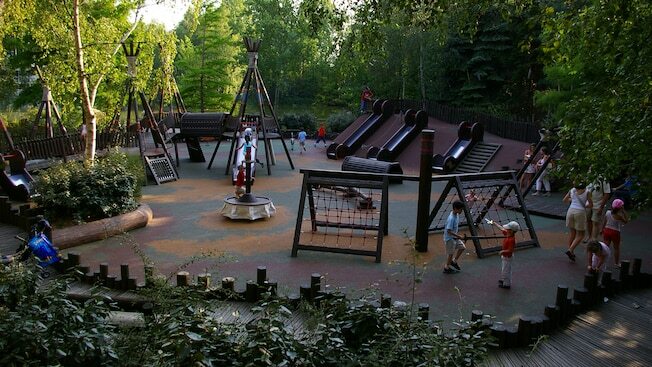 Here, Pocahontas, Meeko and Grandmother Willow accompany young explorers as they slide, climb and swing through the great outdoors in this playground based on a traditional Native American settlement. 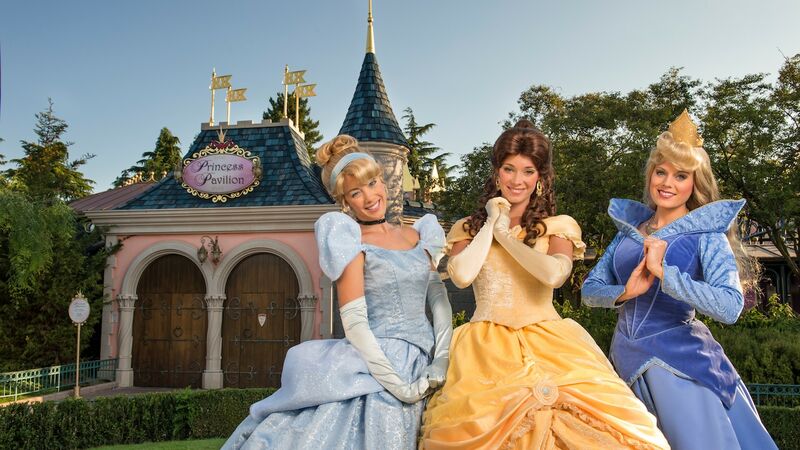 Princess Pavilion You’ve been invited to meet a real life Disney princess. At Princess Pavilion dress to impress, as this is your chance to snap a magical moment amid amazing surroundings, in a right royal occasion. Peter Pan’s Flight Sail high into the moonlit sky with Peter Pan’s Flight. Board a colourful galleon and, with the help of some pixie dust and happy thoughts, embark on a high-flying adventure. Juorney to the Darling children’s nursery and behold the first meeting of Wendy, Michael, John and Peter Pan. Soar through the sky over London and descend into Never Land, home to volcanic peaks and sparkling waterfalls. 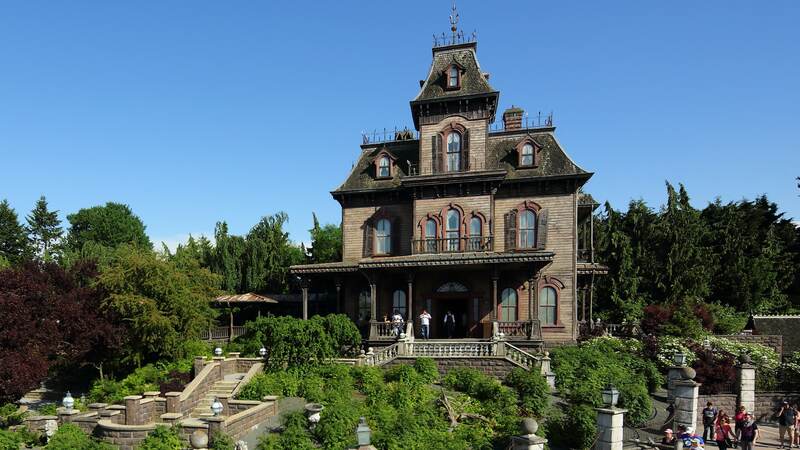 Phantom Manor Muster up some courage and venture up to Phantom Manor, where 999 happy haunts hide one very dark secret. As you edge closer to the ride, ghastly goings-on keep you suitably scared. Rooms stretch, portraits move and mirrors bend, all to a backdrop of eerie sounds. Then, once aboard your doombuggy, the voice of a phantom directs your every stomach turn in an experience sure to have you screaming for more. 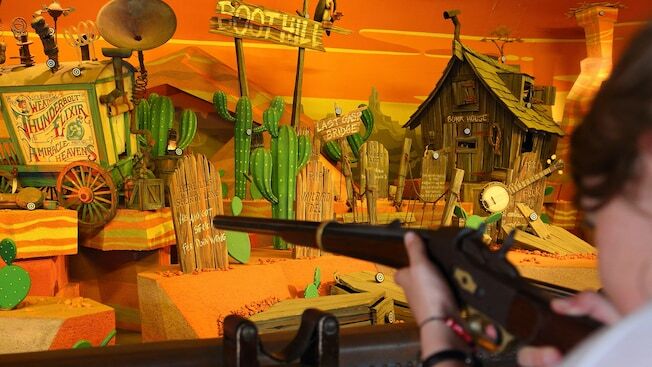 Rustler Roundup Shootin’Gallery Get into the spirit of the Wild West at Disney Rustler Roundup Shootin’ Gallery and test your trigger skills with this shooting range full of interactive moving targets. There is an additional charge for this attraction. Sleeping Beauty Castle Rising high in the sky at the end of Main Street USA, Sleeping Beauty Castle welcomes you to a magical world of fantasy and fun. 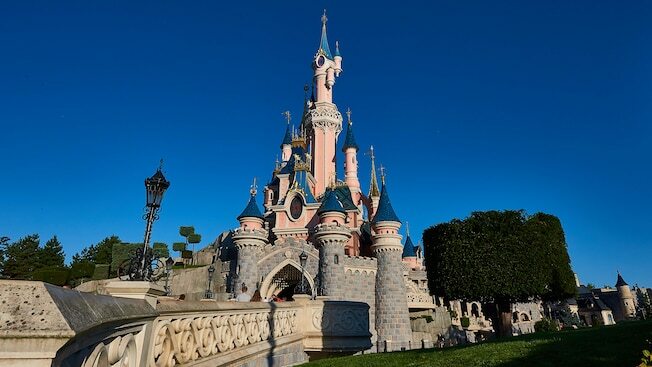 The central icon of Disneyland Paris, the Castle invites all who visit to celebrate in a place where dreams come true. Star Tours: The Adventures Continue Prepare for even more intergalactic excitement with Star Tours The Adventures Continue. 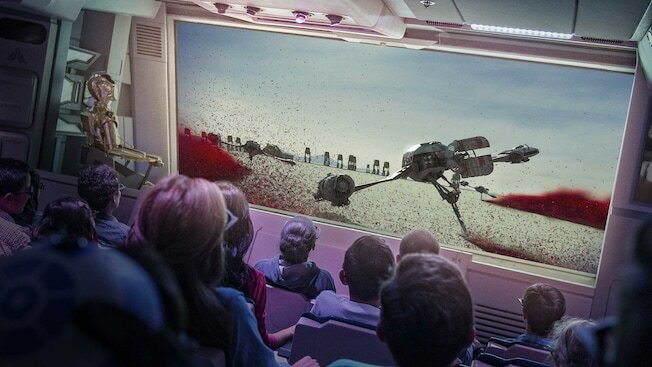 Rebels of all ages will board a Starspeeder 1000 and take off on a thrilling 3D voyage to stunning star systems and war-torn worlds, from Jakku and Hoth to Tatooine and even the dreaded Death Star. 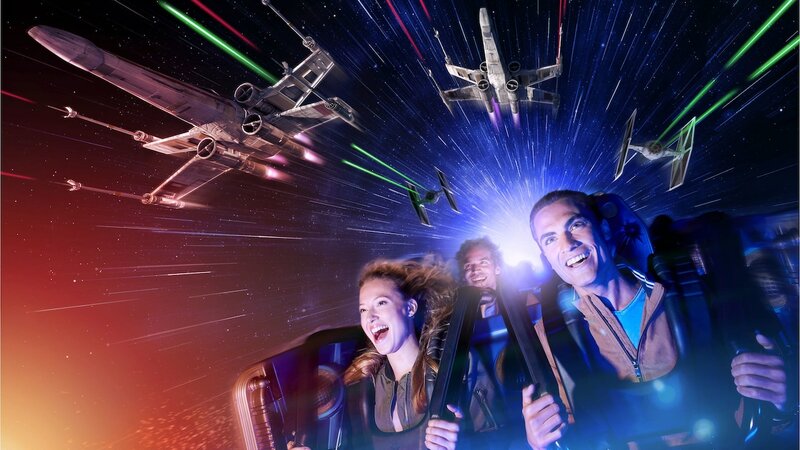 Loaded with state-of-the-art technology and over 60 mission combinations, this is an experience sure to thrill the most devout Jedi in the galaxy. Star Wars Hyperspace Launch yourself into Star Wars Hyperspace Mountain for a thrilling takeover of a classic space attraction. Enlist in the Rebel Alliance and attend a briefing from Admiral Ackbar. Your mission – to pilot a reconnaissance vessel and spy on an Imperial Star Destroyer. But it’s a trap! …………. Starport: A Star Wars Encounter Check in at the Starport in Discoveryland for a brand new, truly unforgettable encounter with a Star Wars Character. Get your best side ready for the dark side because Darth Vader patrols these parts on a regular basis. But have no fear. 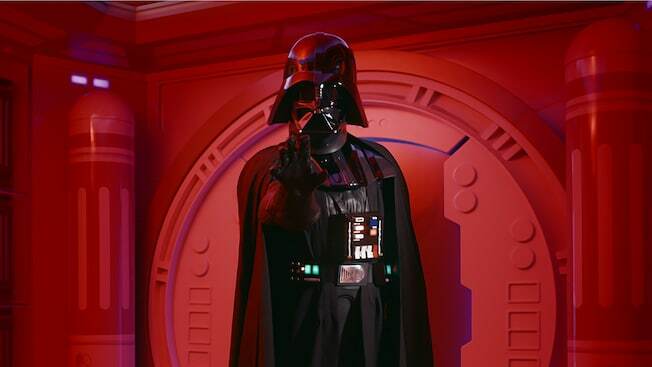 When the Dark Lord of the Sith is away on Empire business, another giant of the Star Wars saga is never far, far away. 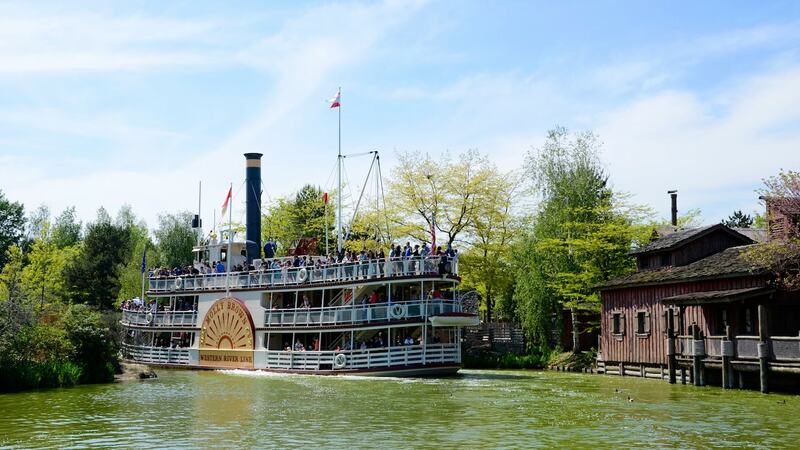 Thunder Mesa Riverboat Landing Take to the water in one of two majestic 19th Century-style paddleboats, Mark Twain and Molly Brown, and navigate Rivers of the Far West at Thunder Mesa Riverboat Landing. On your journey you’ll take in a whole new view of Big Thunder Mountain and Wilderness Island, witnessing cascading waterfalls along the way. Plus you may even spy some smugglers’ caves.